Getting into the middle of this debate about NFL players disrespecting the flag of the United States of America while the National Anthem is playing isn't a wise thing to do. Why? No one is going to win. At some point, I think that they will just stop playing the song, waving the flag or reciting the Pledge of Alliegence. But then, when things get political people usually tune out. - Oscars hit a 10 year viewership low. - Emmys hit a new low in ratings, and the NFL's viewership is slumping again. But I do have a suggestion for those players who take a knee. Pray while you are down there. If you don't know how or what to say, here are a few suggestions. #1 - Pray for this nation and those in authority. "But I don't like them!" That's not the point. They are the elected leaders and those in authority. Pray for them. 1 Timothy 2:1-2 First of all, then, I urge that supplications, prayers, intercessions, and thanksgivings be made for all people, 2 for kings and all who are in high positions, that we may lead a peaceful and quiet life, godly and dignified in every way. #2 - Ask God to direct your steps. 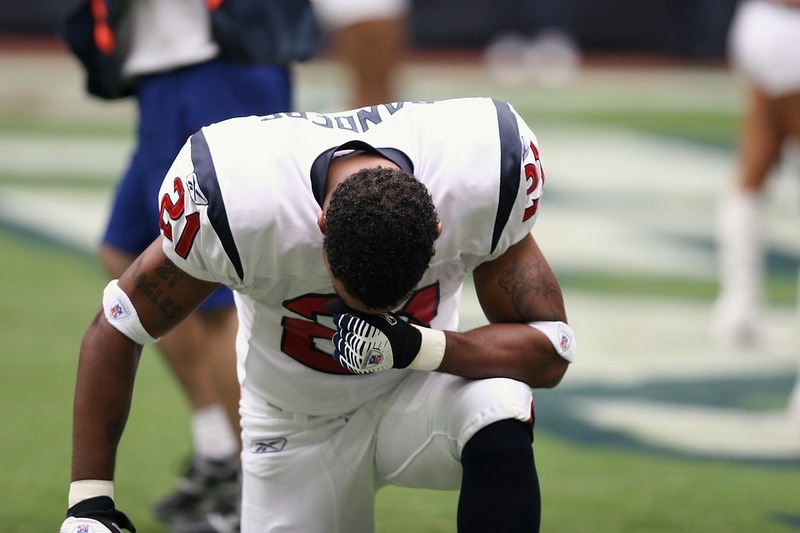 When you go into that end zone, many of you are quick to point up to heaven and say, "Thank You" to God. Now ask Him to lead you to a place where you can make a real difference. #3 - Ask God to give you wisdom. The Bible tells us that if at all possible, live at peace with people. Offending really has never get anyone anywhere. But, regretfully, our nation's culture is to bully and offend. This may not change soon, but you can. Now for everyone who isn't an NFL player. You can apply these same steps to anyone who is in authority over you. Maybe it's a demeaning boss, a tyrant supervisor, or a careless teacher. Whoever it is, your witness as a follower of Jesus trumps your desire to get revenge or offend others. So, take a knee and . . .